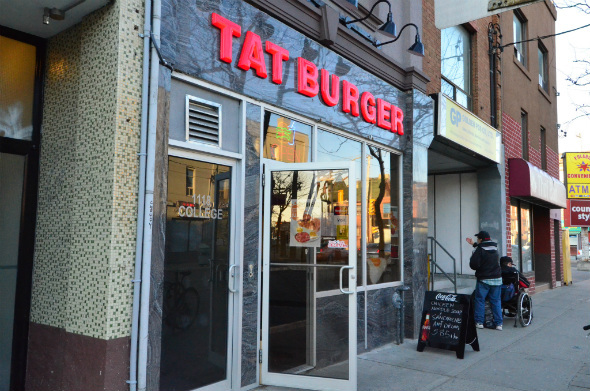 TAT Burger is a brand new dinner/take-out spot on College, just west of Dufferin. 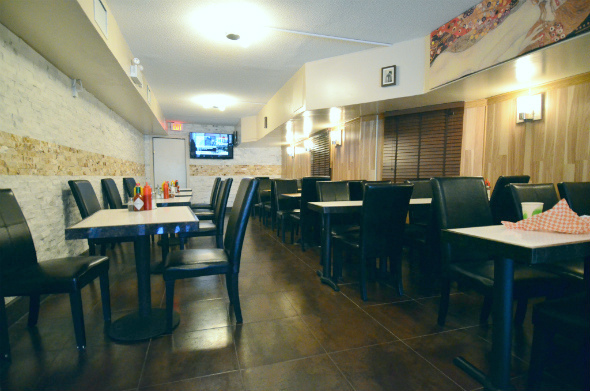 This small diner offers the classic greasy-spoon options at some very reasonably prices. We showed up to check out the new addition to the neighborhood around dinnertime on a recent Monday evening. The place was empty, save for the two friendly and enthusiastic workers behind the counter. The set up is much like the classic burger restaurant from my childhood (think Lick's or Burger Shack ) with an open-air grill and prep area right behind the glass counter. 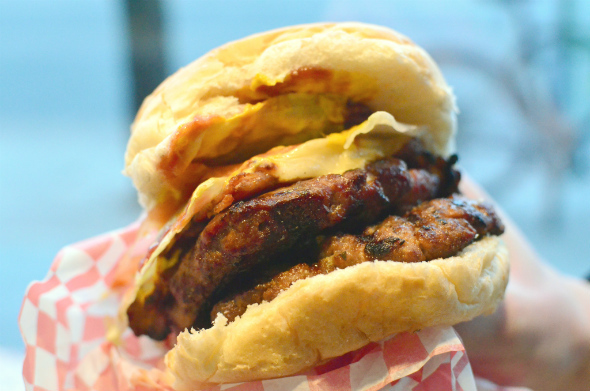 TAT Burger touts a fairly extensive menu offering everything from a basic cheese sandwiches (at $3.25) to full breakfasts (from $2.95) to ribeye steaks (at $8.95). Despite the many options we were urged to try out the burgers - and we obliged. With room for about 25 in the comfortable seating area, we grabbed a table with a full view of the large flatscreen TV playing the Jay's game. After a couple minutes we were called back to the counter to let the guys know how we wanted our burger dressed. We ordered both the bacon cheeseburger ($5.25) and the Super-burger, a double bacon cheeseburger ($6.50), both served with fries. The patties were heavily seasoned and cooked well, they could even have held up fine all alone. However, with the copious options for toppings, we were quick to take advantage and possibly go a little overboard. They've got all your standard toppings (lettuce, tomato, pickles, etc...), but also step it up a notch with (albeit mushy) sauteed mushrooms, sauteed onions, asparagus, and blue cheese - each at no extra charge. 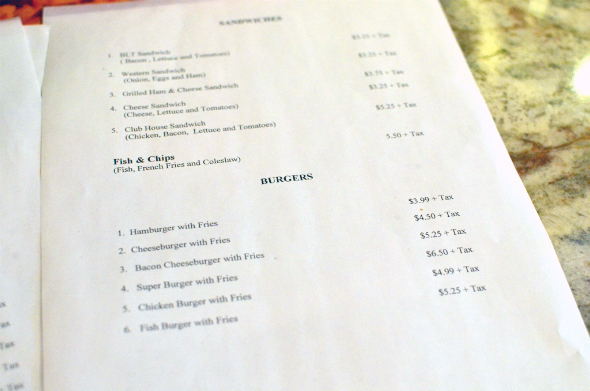 On their recommendation, we also tried the fish and chips ($5.50). The plate comes with a thick piece of very mild tasting white fish in a light batter. 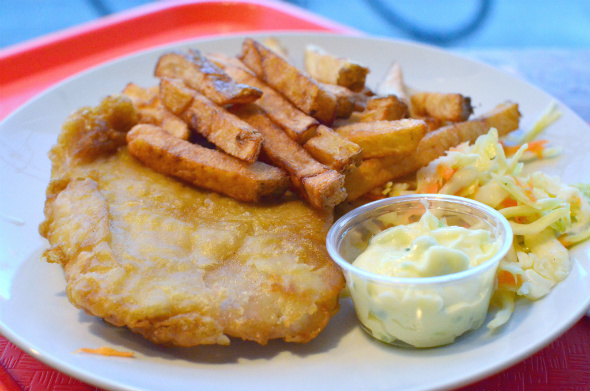 The fish tasted quite fresh and was served with a generous portion of hand cut fries and some standard coleslaw. 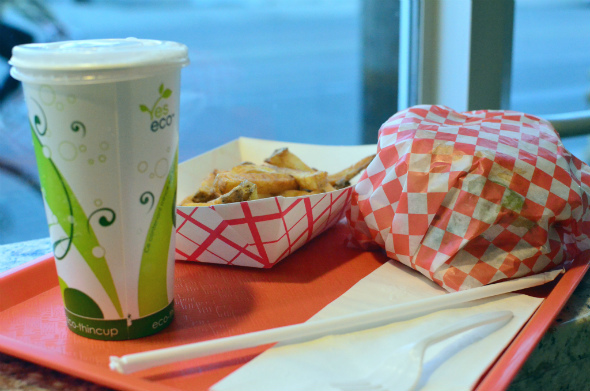 Considering their focus to burgers and minimal kitchen, we were pleasantly surprised with the quality of this dish. TAT Burger is a bare bones, serve yourself dinner with nothing to set them apart from others dishing out similar menus. It seems they've still got kinks to work out, with a few early DineSafe infractions in their opening week. However, if you live in the area and only have a couple bucks in your pocket, TAT Burger is probably worth a shot.